Whether it's high up on a cliff on the North shore of Lake Superior or down in the Mississisppi River Bottoms, Bulach Custom Rock Craftsmen can create your mountains, streams, rivers, rocks and dreams the way Mother Nature intended them to be. Bulach Custom Rock has been in the business of creating artificial landscapes for over 27 years. 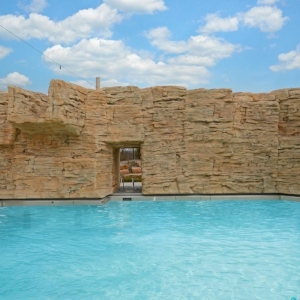 Whether you call it GFRC (Glass Fiber Reinforced Concrete, FRP (Fiber Reinforced Plastic, Foam-core Rock, Positive Rockwork, Shot and Carved, Climbing Wall, or Hardscape Construction, Bulach Custom Rock has done it all and more. Let us exceed your expectations on your next project. We will take you from concept to completion!